You might have seen this month's sensory calendar. October is all about harvest, leaves, and pumpkins and those harvest themes are very sensory experiences! Being that October is Sensory Awareness month, this small series is perfect for sharing. 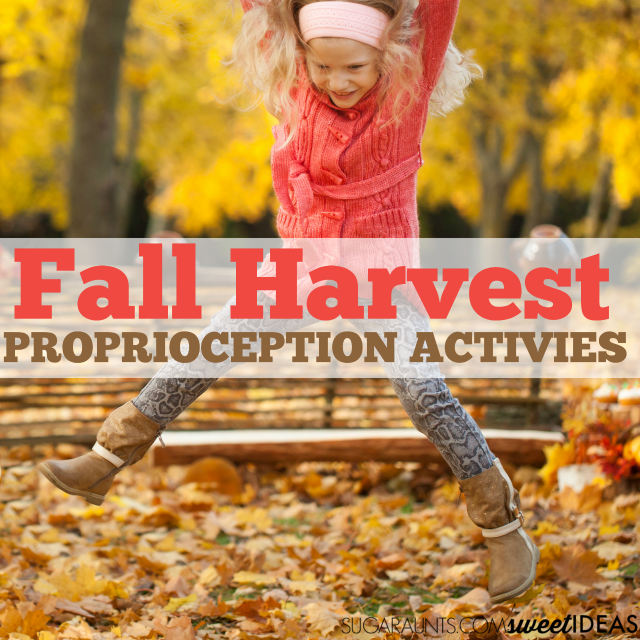 Try the activities below to add a bit of Proprioception Sensory activities with a Fall Harvest theme! If you are looking for more fall or harvest themed sensory play ideas, grab your October Sensory calendar. 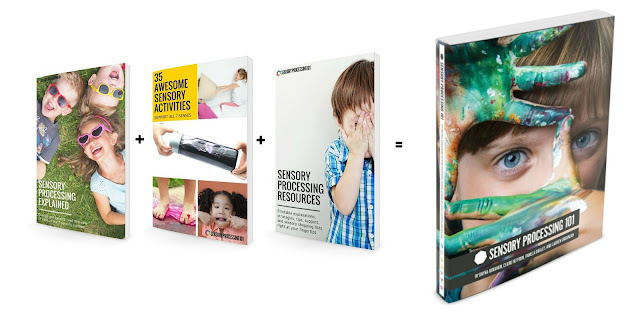 Join us in the sensory challenge as we encourage sensory experiences every day this month. 1. Move Pumpkins- Pumpkins are everywhere. Use pumpkins to address proprioceptive needs by having kids pick up and move pumpkins from place to place. Kids can pick their own pumpkin at a farm, carry their pumpkin to provide upper body proprioception input, strengthening, and addressing balance and coordination needs. Heavy work is organizing and moving pumpkins can address sensory needs simply by picking up and carrying pumpkins. Try these heavy work activities: Place pumpkins in a line, move them in the yard, place them in bucket or wagon, and pull them in a pumpkin parade. Decorate pumpkins with stickers or paints and then carry them to deliver to friends or neighbors. 2. Leaf Rake- Raking leaves is a great proprioception activity. Use a child-size rake for better coordination. 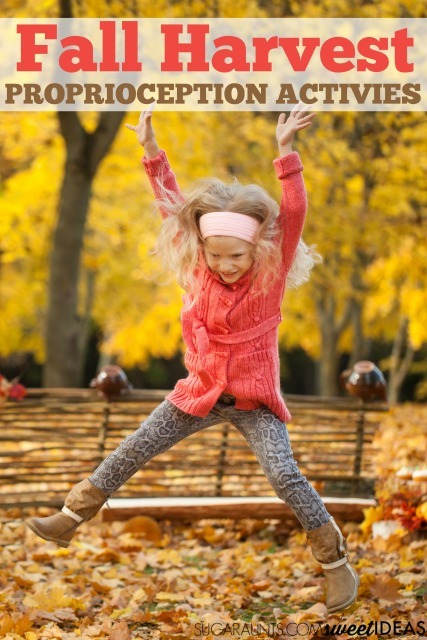 Work on balance and gross motor skills by asking your child to rake on a slope. Use a small pile of leaves and try to rake them into a bucket or laundry basket lying on it’s side. Try timed games like speed raking with several kids. See who can rake their pile the fastest or across the lawn. When you’ve got a pile big enough, jump in it! 3. Hike up hills at a farm- Walking up and down hills addresses balance and coordination of the large muscles of the body. An added benefit of hiking is the proprioceptive input with hiking up and down hills. A sloped farm or hike through a park are a great way to sneak in this sensory activity. Make it a nature hunt to address visual scanning while looking for acorns, pine cones, and colorful leaves. Kids can place their fall treasures into a basket to save for crafts and sensory activities. 4. Pumpkin Rocks- Collect rocks of all sizes and weights. Use them to create pumpkin rocks by painting them orange and then painting on jack-o-lantern faces. Painting rocks is a very tactile sensory experience, using both hands together in a coordinated manner. What makes this activity perfect for heavy work and addressing proprioception needs is playing with the painted pumpkin rocks after they are dry. Stack them, sort them, build with them, create small world sets, and decorate the front stoop with them. 5. Pumpkin Wagon Pull- Load a wagon full of leaves, sticks, corn husks, pumpkins, and even your pumpkin rocks to build a heavy work wagon pull activity. Kids can pull the wagon over the lawn for heavy work through the whole body. Pull the wagon on flat sidewalks or driveways for less heavy work. Go on a family walk with your collections or set up an impromptu Halloween parade with kids in the neighborhood. 6. Leaf Pull- If your lawn is covered with leaves, this is a great proprioception activity for the whole family. Lay an old sheet or tarp out on the grass. Rake it high with leaves. Kids can then grab each of the four corners and pull the leaves around the yard. Try making a smaller version with beach towels for younger kids. Set up an obstacle course in the yard to address visual motor integration needs. Add a vestibular component by taking kids for rides in the “leaf cocoon”. The ebook will remain on sale for $9.99 for the rest of October, but the bundle will only be available until October 10 - so be sure to grab yours ASAP!